Frequently recommended products to help your environment better fit you. 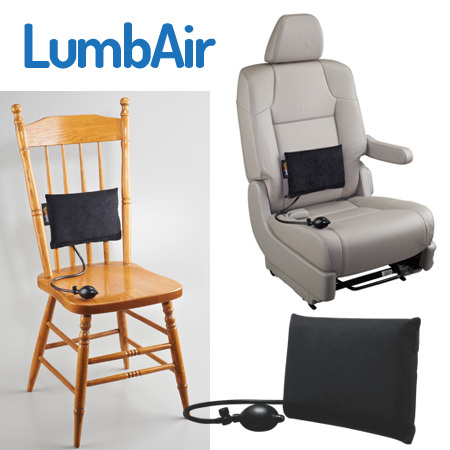 "Recently, this same air bladder technology used in the LumbAir has been shown to reduce disc stress while sleeping. This resulted in the "PropAir sleeper." Many chairs and especially car seats place your hips below your knees. This makes it difficult to maintain the natural curve of the low back thus placing more stress through the low back. This cushion helps bring your hips up a bit which helps reduce stress through the low back. Standing work stations have been a game changer for our clients who have been dealing with various forms of neck pain, low back pain, shoulder pain and more. Having various productive postural options throughout your work day isn't just helpful when rehabilitating an injury, but also in preventing them in the first place. It is one of the most cost effective tools we currently have against repetitive stress injuries. Here's another option for an adjustable standing work desk. Yes, its that important. Did you know that that in various wellness studies they found that those that used their standing work station lost weight without changing anything else in their lifestyle? At the end of the year they lost a comparable amount of calories as they would've if they participated in 2-3 marathons. You don't have to stand all day, but wouldn't it be nice to be productive while standing when you get sick of sitting? Based on our current research this is the gold standard office desk chair. Yes, it is pricey but here's why: it offers many adjustable options to the seat panel (what you sit on) independent of the back rest adjustments. You can also recline back with the seat panel and back rest together as one piece. You can lock any of the above positions in place. The armrests are also adjustable. The reason why having as many of these features as possible is beneficial is because it allows for postural variations. In other words various areas of the body can share the stress of sitting throughout the day vs just your neck, lower back, and shoulders.